In today's mail I had a glorious package. I received the following 3 cards, for a decent shipping rate. Although high, I still got 3 cards for the price of most shipping charges for one card. 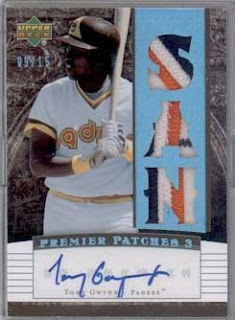 The seller of these cards was refractors4sale, and he is currently offering free shipping on the second card. Anyone looking for refractors, he had a decent selection at last look. For the past several years I have been putting aside all Rookie cards, and first year cards into separate boxes from their respective sets. In doing so, my intention was to decide who I was going to seek out as a collection and try to complete it as best as possible with the funds available. The point to the blog essentially is that sellers on eBay think that because the United States Postal Service raised their prices slightly that it gives them the right to overcharge the customer even more to compensate for the additional nickel it costs them. Now if you go onto eBay you will see dozens of sellers charging $3-$5 for shipping one card. It is outrageous to think that these people do this with a clear conscience. My partner here purchased a card recently, and paid I believe $2.50 OR $3.00 for shipping and the card came in a regular white envelope with a $0.41 stamp. That seller should be disciplined by eBay since you can not take any action other than reporting them for excess shipping charges. My advice to everyone is this: Try and buy what you can on Beckett from one or two sellers to save on shipping costs, and if you buy on eBay be very careful of the shipping cost before bidding, and if possible purchase from the same seller. Do not be afraid to report people for excess shipping charges as well. BURR RIDGE, Illinois: An octogenarian's collection of rare baseball cards fetched $1.6 million in a suburban Chicago auction, officials said. Lionel Carter, 89, of Evanston, Illinois, began his collection as a 15-year-old when he eschewed a nickel candy bar for a pack of 1932 Delong cards. His stash of pristine cards ballooned to 50,000 strong with an estimated value of $3 million and became one of the most renowned collections in the United States. "We don't say this lightly — he's considered one of the pioneers of the hobby," said Doug Allen, president of Mastro Auctions, which sold the collection in a three-week auction that ended Saturday. Carter's mint condition Mickey Mantle rookie card sold for $165,000, three times more than similar cards have commanded. A set of 1938 Goudy Gum cards sold for $280,000 five times more than similar sets. "I think people are paying more because it was owned by Lionel Carter," Allen said. Carter opted to sell his collection out of concern for his safety. Thieves broke into his house just north of Chicago last October and stole cards, although most were safely recovered by police. "It was very sad," he said. "I didn't want to see them go. To me, it was part of my life. A big part of my life." Yes, I was sucked in to all the hype of this product. 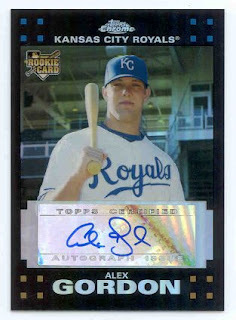 Normally I am very cautious about spending $9.99 for a pack of baseball cards, much less buying a box for $150 retail. 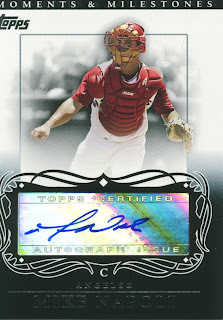 I did buy quite a few packs over a couple of weeks, and picked up one auto card from the single packs, being Miguel Montero. Not as exciting as I had hoped for ten bucks, but such is life. After buying more single packs than I care to admit I went on an eBay hunt for a decent discounted box. I found one for $102 plus $7.95 shipping. What a deal! In this box I pulled an Andrew Miller RC AU, and Martin Prado AU. 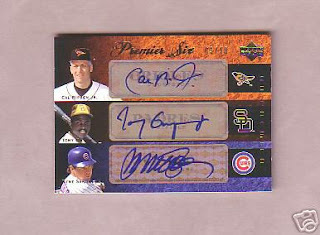 There were no 1/1's or Printing Plates, which was disappointing. A week later while searching eBay, I saw an auction for 2 boxes of Moments & Milestones at a Buy-It-Now price of $209.95 and $10.00 shipping. Yahoo!! $105 a box is the steal of the century. The first box I pulled another Andrew Miller RC AU (very odd to get two I thought), Jonny Gomes AU, and a Billy Wagner 1/1 Red Saves card. 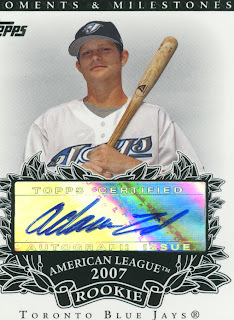 The second box I pulled an Adam Lind RC AU, and a Mike Napoli AU. Again, no 1/1's or Printing Plates. I did get 3 black Pujols and 3 regular ones, which made me happy. 6 Pujols in the final box was more than I pulled in the first 2 together of him. While I don't feel like I will make my money back selling the cards I don't collect, I am hopeful I will come across someone who might trade me for some Albert Pujols cards, or Robinson Cano cards. If you are one of those people please get in touch with me by all means. 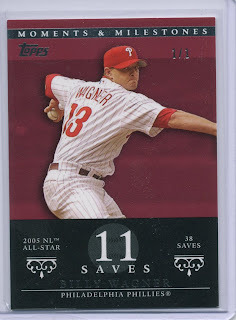 Once upon a time I bought a hobby box of 2005 Topps Turkey Red. By once upon a time, I mean I bought the box 2 years ago on eBay for a great deal. I tend to be a squirrel of sorts, so it took me two years to break it. Let me remind those of you who do the same thing, if you have them from 2005, OPEN THEM! The reason I say this is, the autograph redemptions will expire around Ausust 2007 and you will no longer be able to redeem these. Thanks to Sooz, I made it in time and thank goodness. 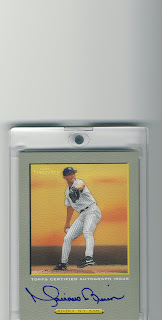 In this hobby box, I received a Mariano Rivera autograph redemption card. 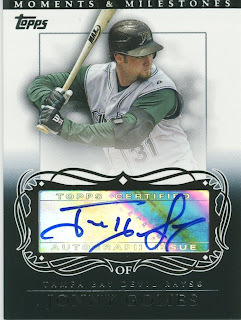 I very rarely, if ever, pull a great auto card. Now, don't feel bad for me because I don't buy expensive boxes so it's my own fault. At any rate, I sent in the card and within 2 weeks I had my Rivera autographed card. 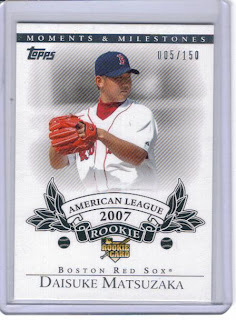 Also in this box I got a Red game used Jersey Card of Alex Rodriguez which made it that much sweeter. 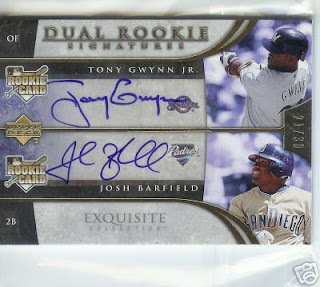 I think at the time I paid $58 for the box, and it was well worth it from those two cards and it was loaded with Yankees base cards, as well as a couple of SP's. 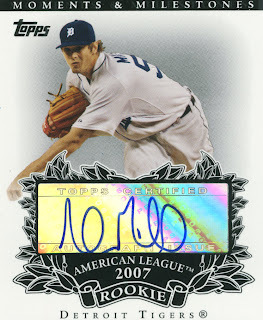 Now the question is..... Do I send out the auto card to get it graded? We are two women, yes, women not girls, who have a serious addiction to cardboard of the baseball variety. We have been collecting since we were children, mainly Yankees players, and both of us have branched out broadening our collections with players we have grown to love. Sooz collects Derek Jeter, Kevin Kouzmanoff , Alex Rodriguez Road to 500 cards, Francisco Cervelli , and Jesus Montero . Marie collects Albert Pujols, Robinson Cano, Adam Lind, Russ Martin, Francisco Cervelli, and Yankee Stadium Legacy. We are always looking for trades to enhance our PC's, and we definitely have enough cards to trade in return. One small note on the trading..... We don't like the phrase "book value." The value of the cards is determined by the two parties trading.